Love, loyalty, friendship and FIBER! Holy Cow! This blue ribbon guy is absolutely amazing. There are very few fawn full accoyos in the US, and this one has Caligula and Royal Fawn for Grandsires. His sire is Accoyo Royal Avenger, multi-color champion and his dam is Caligula's Accoyo Pincessa, two time blue ribbon winner. Born at 18.5 pounds and up and running with the herd and nursing within an hour. He possesses the rare trait of skin folds on his neck that Don Julio Bareda was breeding into his elite accoyos to increase density. He is covered topknot to tail with ultrafine curlycue fleece. His fiber simply drips with glowing golden hued curly crimpy fiber. He has the beautiful champaign colored fleece of his dam, whose fleece was still just 18 microns at age three. Caligula is no longer with us, but this is a way to get two of the greatest bloodlines in the US in one future herdsire. He took his first blue ribbon at the SEPA show. Judge Wade Geese had to look long and hard to decide on the Color champ, with Fawn sandwiched up against the eventual winner. He keeps getting better and better. Fawn has taken lots of great ribbons in huge classes. 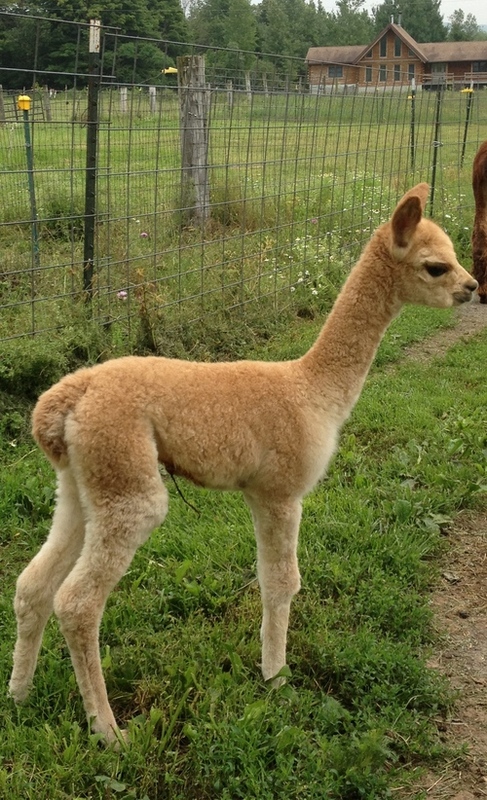 He's retired from the ring now and focused on making cria. Fawn is a big boy (very big like his dam, tall and proud). He is regal with charismatic presence. His leg coverage is amazing. He has huge tree trunk legs! 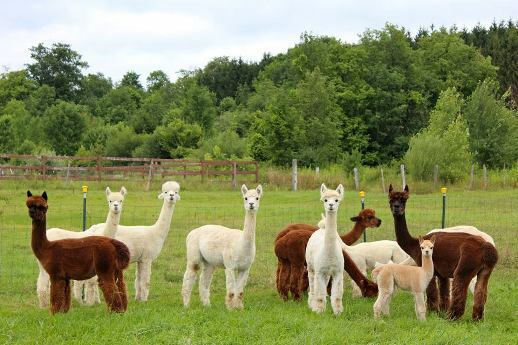 He has been hooking up with the ladies and is expecting more than a few cria in 2008. He is very happy to meet any alpaca ladies. Fawn sheared 13 pounds this year!! He's holding his crimp nicely and his fineness as well. Newsflash Fawn's father Accoyo Royal Avenger sold in auction for 435k (for part ownership)! 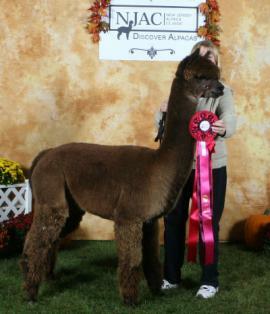 Newsflash: Fawn's daughter Baby Oh Baby took best hand at the AFCNA show out of 300 huacaya fleeces! This black full peruivian cutie oozes potential. Her sire, Smokey Joe, is a multi-reserve grey champion son of Nic Nac (himself a renowned grey color champ). His great grandsire is the amazing Black Magic. With so many great ancestors, we can expect great things from Black Velvet. She has a luscious soft handle, pretty crimp, a nice look, and a very pretty, typey head. Velvet is a tall proud girl whose fleece is so dark now she may actually be true black. Fans of "Napoleon Dynamite" will recognize the name of Kip's big, beautiful girlfriend, La Fawnduh! 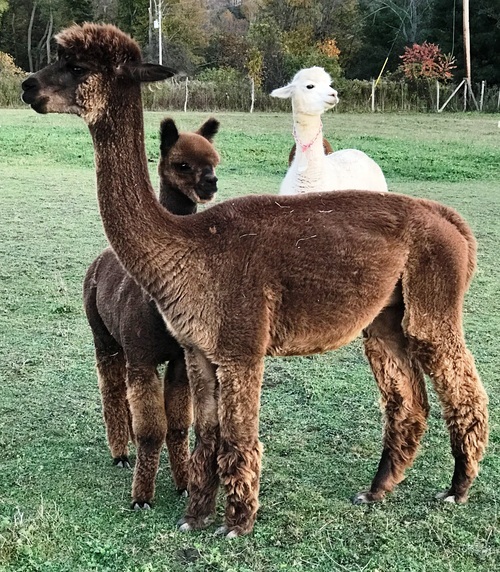 Our girl is Full Peruvian & 1/2 Accoyo & with Nyala's Accoyo Fawn Connery as her dad and a gorgeous true-black mom- this girl totally lives up to her namesake! "Fawdie" as she's known in the barn, has Royal Fawn and Nic Nac in her pedigree. She's a sweetie- and gets sSO excited when it's grain time or for belly-spraying in the summer celebrating with delighted little jumps and bucks. She's made wonderful babies for us with no complications. She delivered a lovely medium brown GIRL out of PC Riley's Life, a Titan son on July 2, 2012. Check out Foxy's listing. 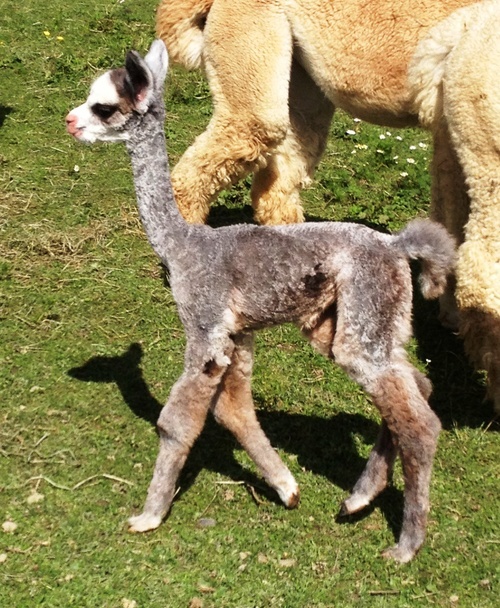 We liked her so much, we've repeated the breeding which resulted in 2013 cria- Goldie Fawn. Bred to full Alianza gray- Luciano, produced a lovely tux gray girl!! 2017 Bred to true black Thor, she produced a boy the same dark color (Luthais). She produced 2.7# of lovely dark silver gray prime fleece this year, too! Comes with a transferable breeding to Shooting Star's Sterling. Qualified buyers are eligible for zero percent financing with 1/3 down with the balance paid over 12 months on listing that are not labelled "cash price". Prices given for animals are for single animal purchases. Discounts will apply for multiple animal packages. 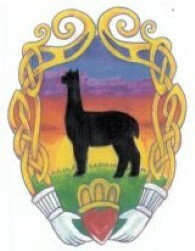 Unless otherwise negotiated, alpacas sell with 60 days free board. Given the changeable price of gasoline, delivery will be part of the sales negotiation. Unless otherwise noted, females do NOT come with breedings. All of our bred females are sold with a live birth guarantee as detailed in our sales contract. Extensive health records are available for review on each of our animals. These records will transfer with ownership. Claddagh Farm offers a 30 day live birth guarantee for animals bred to Claddagh Farm herdsires. 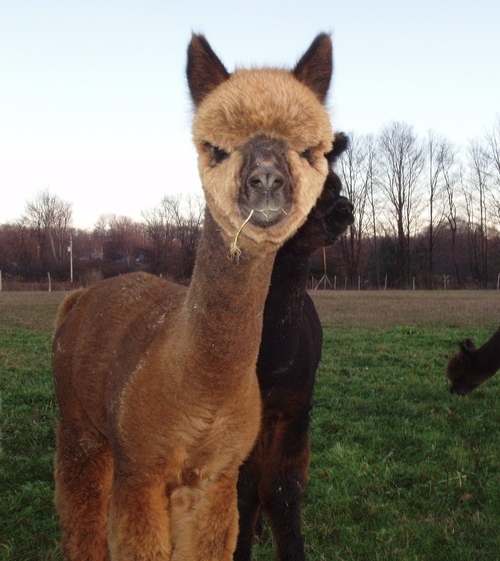 If the cria does not survive to 30 days for any reason, the breeding will be repeated free of charge at Claddagh Farm.